Award winning cooking teacher, cookbook author and former executive chef of two Indian restaurants in New York City, Julie Sahni is the proprietor of Julie Sahni's Indian Cooking School, established 1973 in NYC, which garnered the International Association of Cooking Professionals (IACP) 1998 Award of Excellence nomination, setting it apart as one of the top cooking schools in the country. Ms. Sahni is the author of the seminal Classic Indian Cooking, winner of the André Simon commendation and now in its 42nd printing, and Classic Indian Vegetarian and Grain Cooking, winner of the prestigious Glenfiddich Best Cookbook Award. Her most recent cookbook, Savoring India: Recipes and Reflections on Indian Cooking, won the IACP Best International Cookbook Award for 2002. She has served on the faculty of New York University and Boston University's culinary arts program, and contributed articles to national newspapers and food/travel magazines. 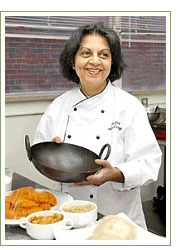 Ms. Sahni's numerous articles and books have earned her the reputation of “The Indian Culinary Authority” in the United States. She has appeared on all major TV networks and hosted episodes for “Chef du Jour” and guest-hosted “Cooking Live” on the TV Food Network. Ms. Sahni is a frequent presenter and keynote speaker at world culinary events and her cooking has been featured in all major television, radio and print media. Julie Sahni’s Gourmet Tours, Inc. has been offering annual cultural and gastronomic tours to India since 1987. The tour is exclusively created and planned with the food enthusiast in mind and is led personally by Ms. Sahni. From 2005 to 2009, Ms. Sahni has organized and led Worlds of Flavor Travels India Tours on behalf of The Culinary Institute of America and earlier Travel Adventures India Tours on behalf of New York University.